Flexible Dog Walking service built around your busy schedule! Whether it’s regular or every so often, my Dog Walking service is flexible and built around your busy schedule, so whenever you need me I’ll be there for you and your dog. 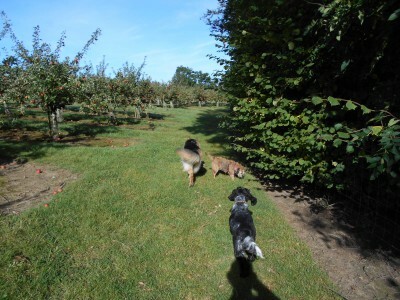 I take great pride in the service I provide and over the years I have gained an excellent reputation for managing dogs’ needs in such a way that they are settled and happy. 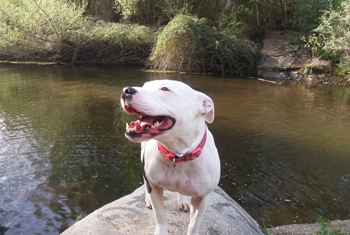 Whether you need your dog walked once in a while at short notice or a set number of days every week, I will do my utmost to accommodate your specific requirements. I am happy to accept any dog, from puppies to elders. Shy, nervous or timid dogs will be handled with patience and care. 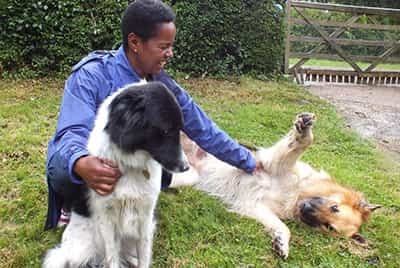 I have cared for my own characterful dogs, as well as numerous guest dogs over the years, so you can be confident that your dog will be in safe and responsible hands. However, I do not walk dogs who are aggressive with other dogs or with people. On my doorstep, I have miles of peaceful woodland and countryside walks away from hazards such as busy roads and passing cars. This is important, as I like the dogs to be off-lead as much as possible. They prefer it that way too! I take a maximum four dogs at a time out for walks. I believe this makes for a happier experience for your dog and for me, as I know I can easily control them all, whatever should occur. You can also request a solo walk or home visit, so that I come and play with your pet at an agreed time during the day. This can be ideal if you have a very young or elderly dog, or a dog who isn't that sociable with other dogs. Whether you want me to walk your dog once a day, once a week, or according to any shift, or irregular working patterns, I will do my best to work around your schedule. If you would like to know more about my prices, you can view the document by clicking on the link on this page. Based in Speldhurst, near Tunbridge Wells, I cover the villages to the west of the town, including Rusthall, Langton Green, Poundsbridge, Bidborough, Penshurst, Fordcombe, Ashurst, Groombridge, Chiddingstone, Cowden, Blackham and Hartfield. Do get in touch to discuss your requirements. Call me on 01892 862738, or send a message through my contact form. "Angela is brilliant with my Border Terrier, Coco. She loves, walks and takes care of her as though she were her own dog. I always feel assured that Coco is in safe hands."